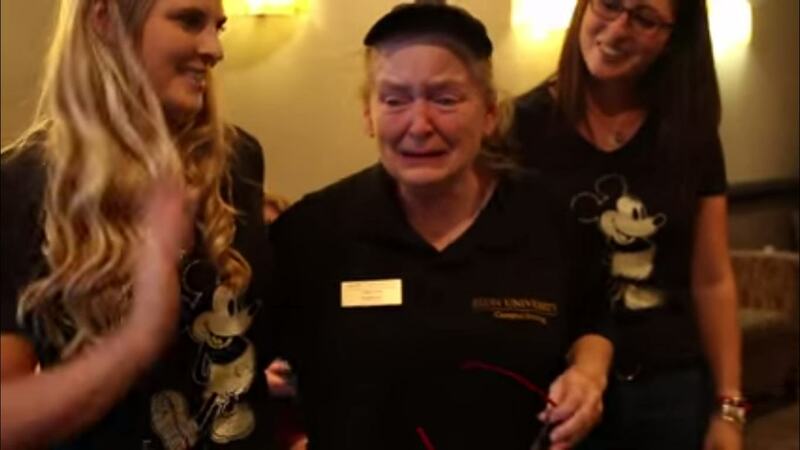 Two thoughtful students made an elderly woman’s dreams come true, raising enough cash so that the long time coffee shop employee could take her family to Disney World. Kathryn Thomas has worked at the Acorn coffee shop on the Elon University campus for the past decade and, when Elon students Taylor Zisholtz and Lucy Smith-Williams heard about Kathryn’s wish to take her kids and grandkids to ‘The happiest place on Earth’ during a late night conversation with her, they decided to make it a reality. I moved my stuff to Lucy’s table, and we were just brainstorming ideas because I looked at her and was like, ‘We’re doing this, we can do this, we have to do something’. To get the ball rolling, the two started a GoFundMe campaign to raise enough money for Kathryn to take her son, daughter-in-law, and two grandsons to Disney World – which the girls estimated would cost around $6,000 (£3,900). In an incredible display of how much those on campus loved Kathryn and the coffee shop, it took only three days for the page to raise $6,500. Everyone knows Acorn, everyone eats their cookies, everyone’s been there a million times. It’s Elon, it’s their school, it’s their stomping ground, it’s something they can link to and it’s doing good for someone, and who doesn’t like doing good? And the video above shows the awesome moment when the girls presented the gift to an emotional Kathryn, along with some bags of Disney goodies and a poster from the GoFundMe page with all the kind comments she’d received. What a lovely gesture this is!